In today’s high-tech age, one naturally assumes that US President Barack Obama’s economic team and its international counterparts are using sophisticated quantitative computer models to guide us out of the current economic crisis. They are not. The best models they have are of two types, both with fatal flaws. Type one is econometric: empirical statistical models that are fitted to past data. These successfully forecast a few quarters ahead as long as things stay more or less the same, but fail in the face of great change. Type two goes by the name of ‘dynamic stochastic general equilibrium’. These models assume a perfect world, and by their very nature rule out crises of the type we are experiencing now. As a result, economic policy-makers are basing their decisions on common sense, and on anecdotal analogies to previous crises such as Japan’s ‘lost decade’ or the Great Depression (see Nature 457, 957; 2009). The leaders of the world are flying the economy by the seat of their pants. There is a better way: agent-based models. 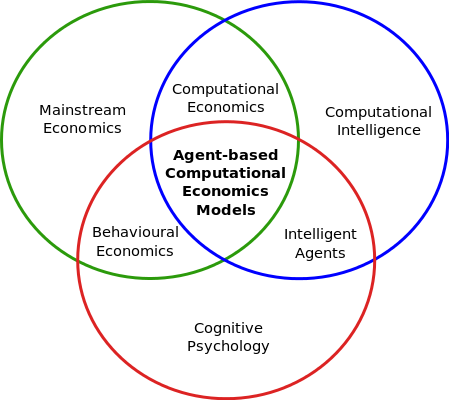 An agent-based model is a computerized simulation of a number of decision-makers (agents) and institutions, which interact through prescribed rules. The agents can be as diverse as needed — from consumers to policy-makers and Wall Street professionals — and the institutional structure can include everything from banks to the government. Such models do not rely on the assumption that the economy will move towards a predetermined equilibrium state, as other models do. Instead, at any given time, each agent acts according to its current situation, the state of the world around it and the rules governing its behaviour. An individual consumer, for example, might decide whether to save or spend based on the rate of inflation, his or her current optimism about the future, and behavioural rules deduced from psychology experiments. The computer keeps track of the many agent interactions, to see what happens over time. Agent-based simulations can handle a far wider range of nonlinear behaviour than conventional equilibrium models. Policy-makers can thus simulate an artificial economy under different policy scenarios and quantitatively explore their consequences. But there is a still larger problem. Even if rational expectations are a reasonable model of human behaviour, the mathematical machinery is cumbersome and requires drastic simplifications to get tractable results. The equilibrium models that were developed, such as those used by the US Federal Reserve, by necessity stripped away most of the structure of a real economy. There are no banks or derivatives, much less sub-prime mortgages or credit default swaps — these introduce too much nonlinearity and complexity for equilibrium methods to handle. When it comes to setting policy, the predictions of these models aren’t even wrong, they are simply non-existent (see Nature 455, 1181; 2008). Agent-based models potentially present a way to model the financial economy as a complex system, as Keynes attempted to do, while taking human adaptation and learning into account, as Lucas advocated. Such models allow for the creation of a kind of virtual universe, in which many players can act in complex — and realistic — ways. In some other areas of science, such as epidemiology or traffic control, agent-based models already help policy-making. Such economic models should be able to provide an alternative tool to give insight into how government policies could affect the broad characteristics of economic performance, by quantitatively exploring how the economy is likely to react under different scenarios. In principle it might even be possible to create an agent-based economic model capable of making useful forecasts of the real economy, although this is ambitious. Creating a carefully crafted agent-based model of the whole economy is, like climate modelling, a huge undertaking. It requires close feedback between simulation, testing, data collection and the development of theory. This demands serious computing power and multidisciplinary collaboration among economists, computer scientists, psychologists, biologists and physical scientists with experience in largescale modelling.